You can look at the small details, possibly missing the larger picture. This is often called mental accounting. Or, you could only look at the larger picture, possibly missing important details. This is often called the illusion of attention. 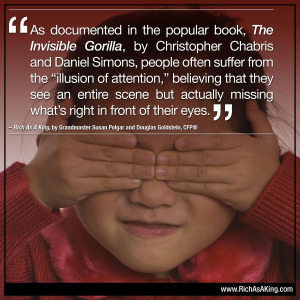 In The Invisible Gorilla, authors Christopher Chabris and Daniel Simons give various examples of what they refer to as “the illusion of attention.” Sometimes, even experts overlook major hazards, such as an experienced airline pilot not noticing a plane on a runway when he was about to land, or a radiologist missing a guidewire inside a patient’s chest. The reason why many intelligent people can make what sound like such foolish mistakes is simply because they are not expecting to find such impediments. Relating this idea to finance, armchair portfolio managers will also miss critical information, even if the news screams facts in a headline. What’s the solution to not miss something important? The best solution for avoiding the illusion of attention or mental accounting is not to rely purely on your own perceptions. Get an extra set of eyes to review your statements. Sit with your spouse, trusted friend or family member, or professional advisor to go over your affairs. Having an objective viewer offer insights helps to ensure that you don’t miss a crucial element on your money board.